Today, on the Solemnity of Saints Peter and Paul, Pope Francis conferred the pallium on 24 archbishops from around the world during Mass at St. Peter’s Basilica. 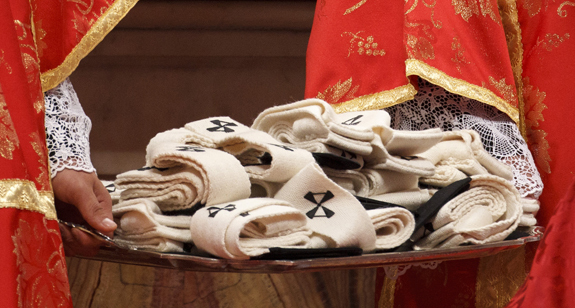 The pallium is a white garment made of lamb’s wool that is worn by the metropolitan archbishops as a symbol of their role as shepherd. Also present at the Mass was a delegation representing the Ecumenical Patriarch of Constantinople, Bartholomew I. It has become tradition for the Ecumenical Patriarch and the Pope to exchange greetings on the feast of St. Peter, the patron of the Holy See, and in November on the feast of St. Andrew, the patron of the patriarchate of Constantinople. Below, via Vatican Radio, is the full text of Pope Francis’ homily.